MUFF WIGGLER :: View topic - Introducing The Reflex LiveLoop Sampler! Introducing The Reflex LiveLoop Sampler! 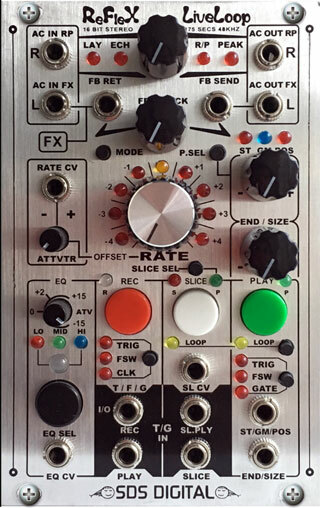 A few months back, a fellow Wiggler noticed I'd designed a tiny sampler machine for a live performance mini box, and asked if this could become a euro-rack module. The rest is history. If you have been following the Reflex thread in the MW DIY forum, you'll know that it's been quite an undertaking, but finally the Reflex is ready to show the world! Record Sample Rate: 174 seconds in stereo at 48Ks/s. This isn't an "up to" spec., it's better than CD quality for almost 3 minutes! - Spectrum Analyzer for RGB "Color Organ" audio indication/analysis. - Zero Crossing Point Loop Lock and Soft-Mute technology for click free speed looping. - Low latency triggering <1mS for fast triggers, click free soft shoulder for slower. 7uS trigger pulse. - Peak Auto-Slicing by audio levels and intelligent noise floor, amplitude angle/delta algorithm. - "Slice Groove" 200 note sequencer feature: Record a tap sequence using selected slices, then loop playback! - Slice Record Over-dubbing / replace inside defined slice. - Simultaneous Record and PlayFX/Slice to loop/echo out applied FX. - PlayFX Gate input for active on high reset on low: live freezing! - G-Move Flowing Granulizer Direction/Speed and Grain Size knob and CV controllable. Sizes: < 1 mS to 250 mS.
- G-Move Granulizer "roll space" can be defined by presently playing MiniLoop, Echo/delay, Layer or Slice boundries. - Layered PlayFX priority: MiniLoop/Granulize inside a Slice, Granulize inside of a MiniLoop, Slice over a MiniLoop. - Play FX or a Slice while still Recording / Layering / Echoing via Buttons or T/G. - Built in CV band controllable EQ for fine tuning feedback and FX output. Flat band mode for CV VCA FX. Thanks! And thankyou enj_music for doing that modular grid change! Holy smokes. That's a pretty awesome module. i'll just ask this here, since i'm guessing others will want to know too...where did the power consumption end up at? This thing looks/sounds amazing, nice work, great documentation/demos! Yes, just I noticed I forgot the power. It's at 190mA +12V and 60mA on the -12V side running full out. Was tracking the progress of this in the DIY forum, looks really fun, congrats! Was lookng for a module like that!! A sort of Electrix repeater for euro right? Will it be DIY only or assembled also? Thanx for the great work!! Great jwm, someone else posted it there and I have never had the chance to update it. My Phonogene suddenly got nervous. You clearly waited until i bought a Tyme Sefari to punish me. So the sample rate input would be like the varispeed in Phonogene? With negative voltage the sample goes backwards? Does it track 1/v per octave? I have been LOVING the video demos in the DIY thread as new features were added and explained! REALLY excited for this and hope more vids follow (until I can afford one!) - congrats Sandrine! No that's not right, the Rate control goes +/- 5 octaves in forward or reverse so center is standard 48Khz rate. With a CV present, the attenuvertor is inserted and the Rate knob becomes a +/- offset. The PlayFX (green button) uses the Start/End knobs to do a reverse. Start knob bigger than End, so you can take just a window of the sample or the whole thing, then vary the rate. This video covers that sort of. It was in answer to a question on recording a reverse sample then SOS new audio on to it. A G-Move also can reverse play by moving through a sample backwards when the "Start" knob is left of center, kind of the way you're describing, but without changing the pitch.